This weeks Pic(k) of the week, concludes the 9th consequtive year of my Pic(k) of the week series. What initially started as a one year project has evolved to so much more; never has a Pic(k) of the week post been missed over the 9 years! Yes, the plan is definitively to continue with the project in 2019! Frequent blog readers, would have seen other images shot during a recent photo-adventure to Cambodia last month. I've blogged about both my "THE KIDS OF CAMBODIA" project and the "TEMPLES OF ANGKOR" (slideshow here) series. The conclude the Cambodia images, I would like to present my "Cambodia, daily life" gallery which finally went online last week. The cover image and the one I'm probably most proud of, is the image below of a monk looking up. I will be reflecting on 2018 photographically speaking somewhere at the start of the New Year. For now, I would like to wish all readers a Happy 2018 and see you all on the other side! Remember: "Tomorrow is the first page of a new 365 page book, you better write a good one"
Hard to believe, another year has almost passed again! To the ones celebrating Christmas, a "Merry Christmas" to all of you and your families! 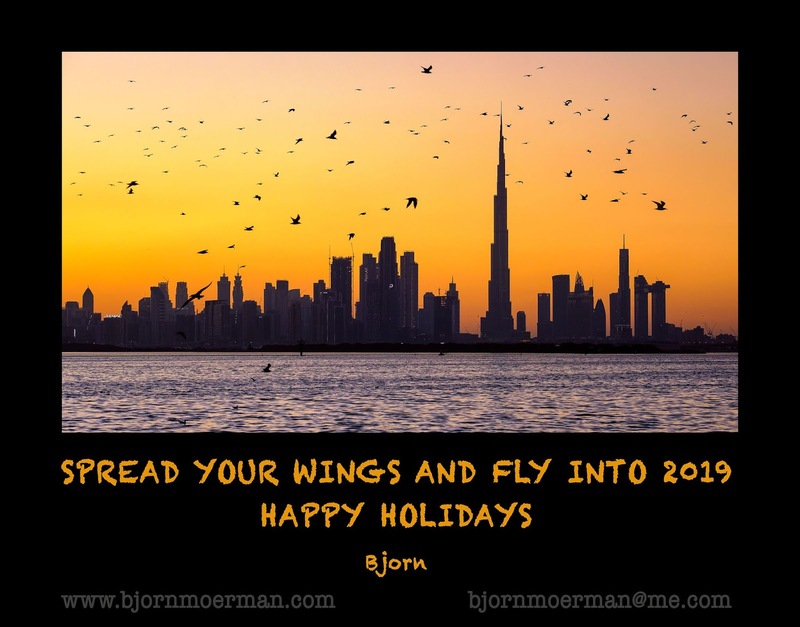 To all blog readers, a Happy 2019! May the new year bring you good health, joy and happiness! I've been documenting life around Dubai Creek for more than 10 years now! It is the place where I keep coming back to whenever I want to escape modern Dubai. There is something very special about the hustle and bustle on both sides of Dubai Creek, a waterway splitting Dubai in two parts; Deira to the North, Bur Dubai to the South. To me it is unbelievable that people that have been in Dubai for several years, have never been to this area of town. It is the heart of the city where Dubai was started not all that long ago and has a completely different vibe from "New Dubai". 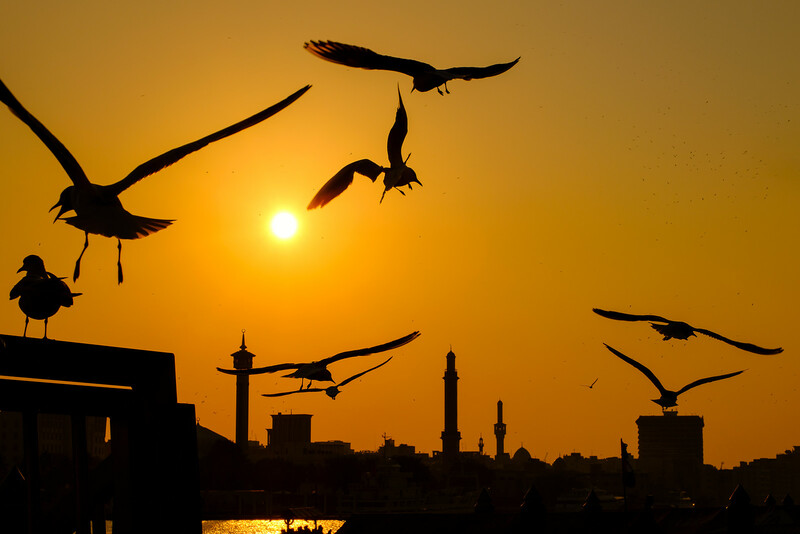 Early in the morning and before sunset, it is common for people to feed the birds on Dubai Creek; always a great photo opportunity! When the Fujifilm X-T3 was released a few months back (review here), I praised its fast autofocus and high speed shutter functions and still very much love it today! By the way, X-T3 owners, be sure to update your cameras to the latest firmware; here for more. Fast moving birds like the mad seagulls of Dubai Creek, are a perfect test subject for high speed photography. Don't be shy to flip your cameras into burst mode and experiment! The only negative with shooting at 20 or even 30 frames per second is that one will come home with a lot of images to sort and potentially edit. What stood out in the image below, is the optical illusion where it looks like one of the birds is about the loose one wing. Still not quite sure what is going one, but it surely looks weird! While eventually I would love to see the "Life at the Creek" collection, make it into a self-published book, the entire gallery can be found here. Remember: "Birds born in a cage, think flying is an illness"
A few weeks ago, I blogged about my visit to Angkor Wat in Pic(k) of the week 48; likely the best known place in Cambodia. What a lot of people don't know, is that Angkor Wat is just a fraction of the Angkor site which covers about 400 square kilometers. From the 9th till the 15th century, Angkor, Khmer for Capital city, flourished as a megacity. Until the industrial revolution, it was the worlds largest city with a population of more than 1 million people at its peak in the 12th century. It took researchers till 2007, by using aerial and satellite images, to conclude that Angkor was such a megacity, consisting more than 1000 different temples. What is left of the old Angkor city today, is anything from a piece of rubble in the jungle to entire temples like Angkor Wat and many others. One of the harder ones to shoot is also one of my favorite temples in Angkor; Preah Khan, seen in the image below, is a large temple built in the 12th century for King Jayavarman VII to honor his father. The two large statues on the West entrance standing amongst the lush green, are especially photogenic. Beside some clearing of the jungle, the temple is largely left unrestored after it was discovered in the beginning of the 20th century adding to the general atmosphere and mystique. Unless you are Cambodian, you must have an access pass, often also referred to as an "Angkor pass", to enter the site. As of NOV 2018, it costs 37,-USD for a single day and 62,-USD for a three day pass. More info can be found here. With 2 million people visiting the Angkor temples annually, it can get very busy, especially during the high season. Avoiding the crowds is therefore essential if wants to do some decent photography. I personally used the services of Photo Cambodia, let by Dutch Photographer Eric De Vries. We did spend 4 days with Eric photographing remote villages outside Siem Reap and the Angkor temples; I can definitively recommend Eric's services, even if you can only hire him for a single day! Today, Angkor doesn't really exists anymore as a city where people live; when visiting the Angkor temples, people stay in Siem Reap, which is just a short tuk tuk ride away. As documenting some of the temples of Angkor, was one of the main objectives of my latest photo-adventure to Cambodia, I've made a short slide slow presentation, called "Temples of Angkor". A small resolution can be found below, but please make sure to watch it in HD for the best viewing experience at the following link here. 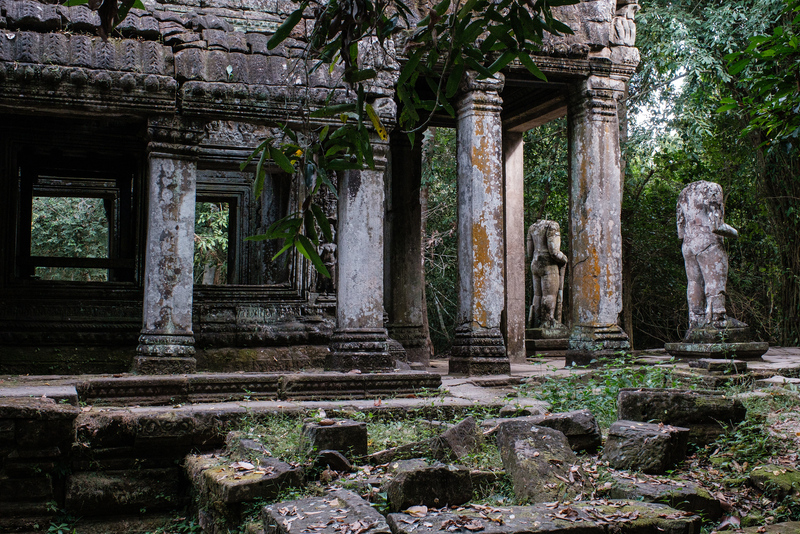 A gallery of all the "Temples of Angkor" images can be found here. Remember: "We shape our buildings, thereafter they shape us" - Winston Churchill.